COLLEGE STATION, Texas — With so much talent on hand in each race, the winners of the 800s at the 2017 NCAA Indoor Championships were bound to be studs, almost by definition. Oregon’s Raevyn Rogers was your women’s champ in 2:01.09, while UTEP freshman Emmanuel Korir followed up his world indoor best in the 600 earlier this year with his first NCAA title in 1:47.48 despite not stepping on a track for three weeks before NCAAs. Texas A&M sophomore Jazmine Fray sent shockwaves through the women’s 800 collegiate scene earlier this year when she whacked 4.07 seconds off her indoor PB to set the indoor collegiate record at 2:00.69, but the event returned to its recent normal state tonight as Oregon junior Raevyn Rogers won her fourth straight NCAA title (2015 outdoors, 2016 indoors and outdoors, 2017 indoors) by closing in 29.69 to win by more than a second. Virginia Tech’s Hanna Green had the second-best close of the night (30.27) to finish second for the second straight year as Fray, who had the lead at 400 and 600, ended up 4th in her first final at an NCAA champs. Rogers and Fray both started in the outside stagger (3 outside/5 inside) and coming off the second turn of the two-turn stagger, Rogers and Fray were basically side by side. Rogers had a slight lead at 200 (28.01) but Fray would take it on the back stretch of second lap as she hit 400 in 60.04 and 600 in 1:31.20. Rogers was running just behind Fray throughout and just after they hit the bell, Rogers pushed and went to the lead. She wanted the lead and didn’t mind running extra distance on the turn to get it. Her lead would increase all the way to the finish. As they entered the final turn, Rogers led Fray by 3-4 meters and soon it was clear no one was catching Rogers. In the final straight, Fray would fade from 2nd to 4th as Green moved up from 4th to second. Rogers won her first NCAA title as a freshman outdoors at NCAAs in 2015. She hasn’t lost one since as this was her 4th straight NCAA 800m title. Rogers went to Kincaid High School in Houston (an hour and a half from here), so this win had to be a little bit special for her. We didn’t get to talk to Rogers after her 800 as she still had to run and anchor the 4×400 for Oregon (where they finished second to a collegiate record by USC). Plus, like she often is after 800s, Rogers was in no condition to talk. She looked totally spent and could barely stand. It’s just part of the way she races. Her future continues to be super bright, but it’s been that way for a while as people have been predicting NCAA wins for her for years. 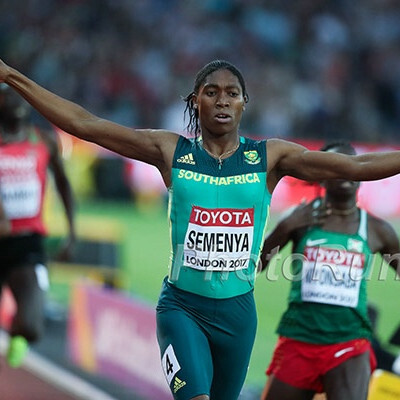 Someone might want to update her Wikipedia page as it at the time of writing says, “She is the expected winner at the Indoor Championships in March, 2016.” How about changing that to 2018? Green was too far back to catch Rogers, but she moved up incredibly well over the final lap and said she had a lot left, even though today’s run was an indoor PR. 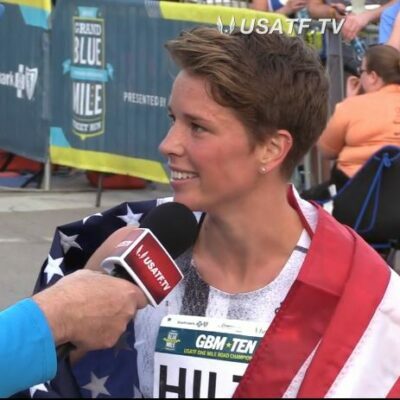 That close gave her confidence, and Green wants to go a lot faster than 2:02 outdoors, saying that she’s shooting for 1:58 or 1:59 (the collegiate record is 1:59.11 by Suzy Favor Hamilton). Normally, when the collegiate record holder finishes fourth at NCAAs on her home track, it’s a huge disappointment. And sure, in the short-term, tonight’s race for Fray was disappointing. But perspective is key and as a whole, her season was a HUGE success. 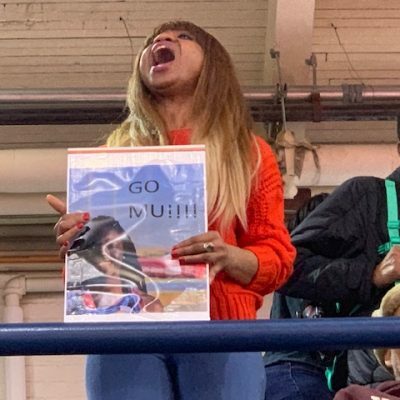 Before the start of the year, if we told Fray, who had never scored at NCAAs and sported a 2:03.25 outdoor pb, that she’d run 2:00.69 and score at NCAAs, she’d sign up for that immediately. Coming into the 2017 NCAA Indoor Track and Field Championships, we expected the men’s 800 final to be one of the most unpredictable of the mid-d and distance finals. 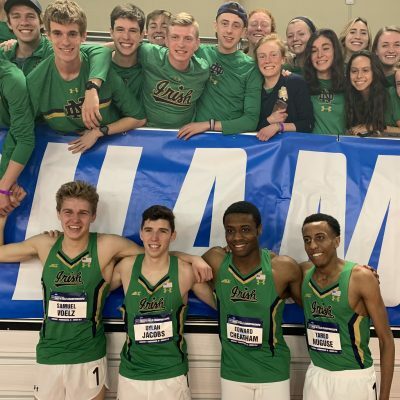 After all, last year’s champions in collegiate record holder Donavan Brazier and Olympic bronze medallist Clayton Murphy were gone and nine guys had broken 1:47 heading into the meet. The race certainly lived up to its billing as here’s what it looked like halfway down the homestretch. In the end, UTEP freshman Emmanuel Korir of Kenya, who briefly held the world’s best for 600 meters earlier this winter, emerged as the winner by going from fourth to first on the last lap to win in 1:47.48 as he ran down Virginia Tech senior transfer Drew Piazza (spent his first three years at New Hampshire) (2nd 1:47.62) as Georgetown’s Joseph White ended up third in 1:47.70. 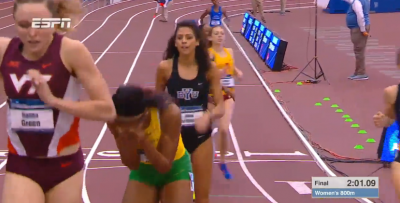 The contact didn’t really change things too much as heading into the final turn, Piazza still led, followed by Harris and then the two UTEP runners. On the turn, Korir started to move up but he was still in third coming off the final turn behind a fading Harris and Piazza, who, just as he had a lap earlier, led by a few meters. 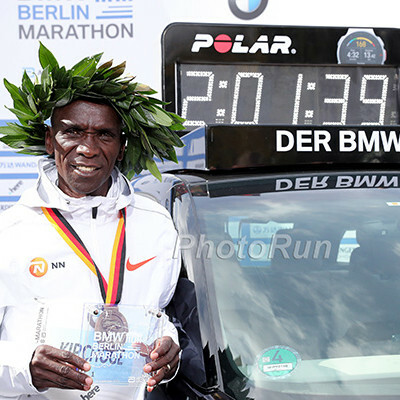 Was their enough time for Korir to catch up? 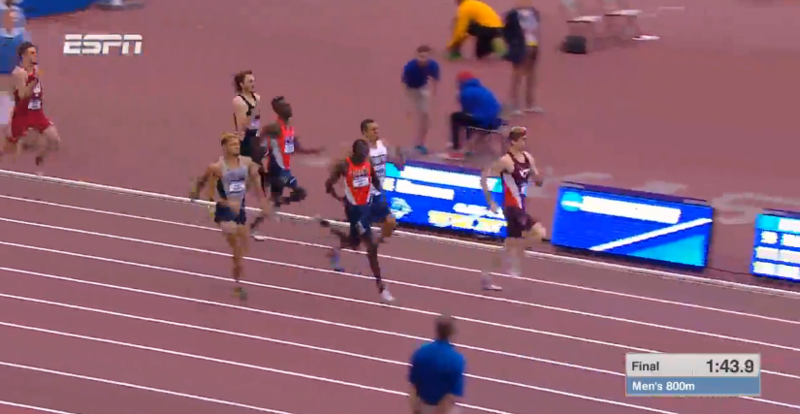 Just barely as Korir got by Piazza with 11-12 meters left. Georgetown’s White, who avoided all of the contact and enjoyed a smooth trip for much of the race on the rail also moved up late to take third. Korir’s coach Paul Ereng has emphasized that his freshman pupil is inexperienced (he only took up the 800 last year), particularly when it comes to racing indoors. And while that may be the case, his talent is so great that he was able to win this race despite not being in great position at the bell — and despite spending the last three weeks in the pool due to an ankle injury. As Korir gets healthy and continues to gain experience, he could develop into something truly special — as if winning an NCAA title isn’t special enough. 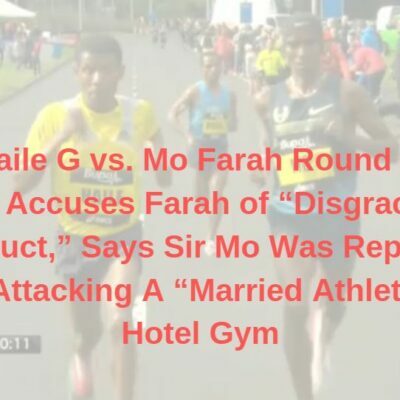 Piazza said that the while the contact with Saruni took him by surprise, it didn’t make much of a difference as it actually helped move him forward. 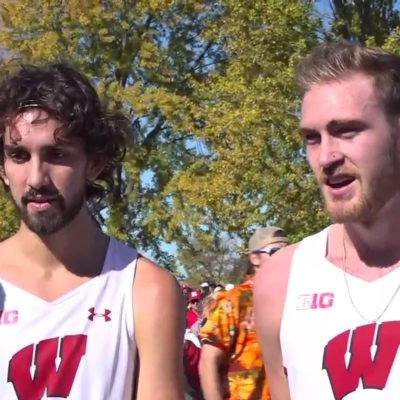 Overall, he was pleased to take second and came a straightaway away from becoming NCAA champion. As he rounded the final turn, Piazza was dreaming big and he thought to himself Holy crap, no one’s passed me yet, this could actually happen! Korir did manage to get him before the line, but second is not bad at all for a guy who had never made an NCAA final before tonight. White said that there was a lot of bumping, but that comes with the territory in an indoor 800. He closed well, was happy to finish third and is already looking forward to the outdoor season.